Nanocrystalline materials exhibit exceptional mechanical properties, representing an exciting new class of structural materials for technological applications. The advancement of this important field depends on the development of new fabrication methods, and an appreciation of the underlying nano-scale and interface effects. This authored book addresses these essential issues, presenting for the first time a fundamental, coherent and current account at the theoretical and practical level of nanocrystalline and nanocomposite bulk materials and coatings. The subject is approached systematically, covering processing methods, key structural and mechanical properties, and a wealth of applications. This is a valuable resource for graduate students studying nanomaterials science and nanotechnologies, as well as researchers and practitioners in materials science and engineering. 7. 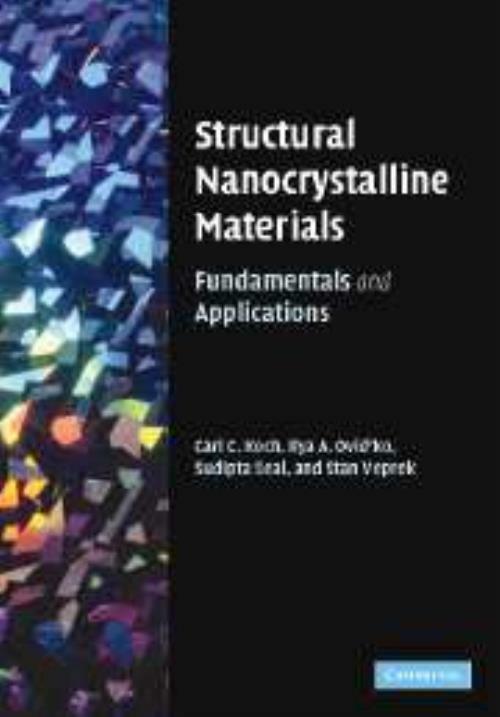 Applications of structural nanomaterials. Carl C. Koch North Carolina State University. Supita Seal is a professor for the Advanced Materials Processing and Analysis Center at the University of Central Florida (UCF). He is also the Nanocoordinator for the Office of Research at UCF, and Director of the Surface Engineering and Nanotechnology Facility. His key research interests include surface engineering, nanoscience and nanotechnology. Ilya A. Ovid'ko Russian Academy of Sciences, Moscow. Carl C. Koch is Professor and Associate Department Head of Materials Science and Engineering, at North Carolina State University. His principal areas of research include nanocrystalline materials; amorphization by mechanical attrition; mechanical alloying; rapid solidification; high temperature intermetallics; oxide superconductors; and metastable materials. He is a fellow of the American Physical Society and the American Association for the Advancement of Science. Sudipta Seal University of Central Florida. Ilya A. Ovid'ko is Professor and Head of Laboratory for Nanomaterials Mechanics and Theory of Defects, at the Institute of Problems of Mechanical Engineering (Russian Academy of Sciences) in St Petersburg. His main research interests include nanostructured bulk materials and films; grain boundaries; and advanced materials (nanocrystalline, composite, non-crystalline). Stan Veprek Technische Universität München. Stan Veprek is Visiting Principal Scientist at the Singapore Institute of Manufacturing Technology (SIMTech), Singapore. His areas of research interest include materials, and surface science; plasma CVC PVD; thin film coatings; and light-emitting Si and microcrystalline Si. He also teaches courses at the Technical University Munich and the National University of Singapore.